I've been wanting to share this for a while. I made paper chains for my best friend's baby shower in early October. I volunteered to make them because I thought the room could use a little color, I thought it would be easy, and I knew I had all the materials. Only the first point turned out to be true. Oops! I used mostly scrapbook paper, but that turned out to be too thin, and white on the inside (boring!! ), so I doubled most rings (which more than doubled creation time). I ended up not having much solid colored paper, but my mom saved the day and brought me some from her stash. It helps to have two crafty parents to steal supplies from. I used tape for the connections, and I believe the rings are 1.5 inches wide and 12ish inches in diameter (some paper was 11.5, and I let that slide). I made probably 120 FEET of this chain. I wish wish wish I got a picture with all of it. It was along all the windows, on some of the tables, and down this 50 FOOT beam in the middle of the room. Maybe someday someone will send me a picture they took of the room. We'll see. 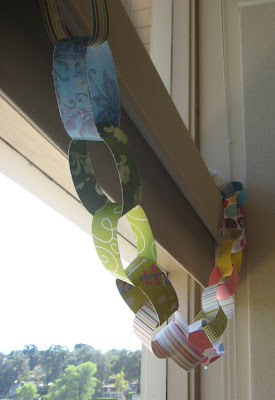 Since I made the chains, I've seen so many ideas for garlands and bunting that would have been SO MUCH easier than my paper chains. Oh well. They looked great, and there's something so nostalgic about paper chains. I've seen great looking chains where the person did each length of chain the same color and did a few chains of different colors. This would be beautiful and easy, especially if you were to use card stock--void having to double the chains at all cost!! Happily, my chains are so beloved that my bestie took them home and used them to decorate her children's bedrooms. We LOVE the paper chains!! We are going to put more up in the "blue room" too since Andy can't decide where he wants to sleep!! But they are so fun and makes each bedroom feel like a party!